1. 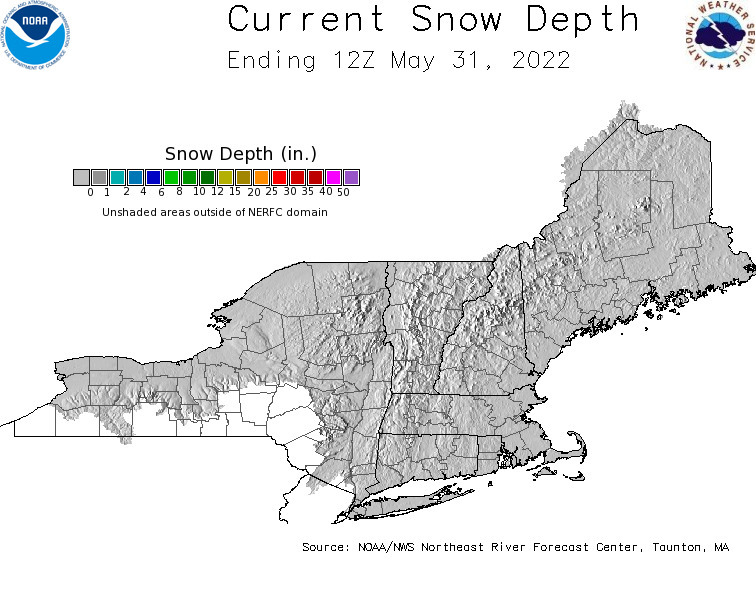 The skis should be long. 2. The skis should be cambered. 3. The bindings should fit a comfortable boot. 4. The entire setup should be light. With these goals in mind, I built a ski setup for my long distance adventures. I chose Karhu's XCD GT ski. 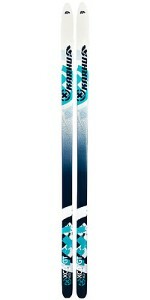 One of the slimmest of the XCD line, they are lighter and more cambered than the Guide or 10th Mountain skis. However, if you're looking for a new pair of Karhu's: ... don't. They're out of business. They were bought by K2, and as of this year, are produced under the Madshus label. All of the Karhu XCD (now Madshus) skis have "waxless" tracked bases, which allow the middle of the ski to grip snow when weight is applied. You'll still need skins for steep climbs, but the waxless skis will perform well on rolling terrain. 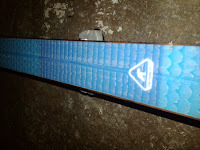 I chose the 195cm length, almost a full 20cm longer than my regular downhill skis. In the ski world, longer is faster. I'm not exactly sure why this is true, but it is. Don't question it. Ever. At 69mm underfoot the GT's are not meant for blower powder in Utah. However, they are wider than a traditional cross country ski, so that they will still provide some float. The GT's also have full metal edges, which are a necessity given the likelihood of finding icy crust and hard pack on any winter day in New England. I mounted the GT's with a Silvretta 500 backcountry binding. 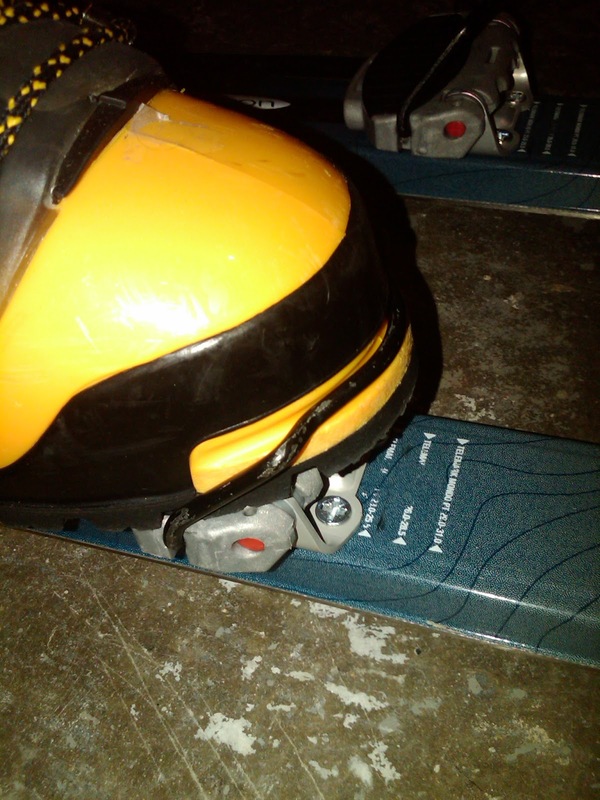 The Silvretta 500 is one of the lightest and most versatile of Silveretta's line of bindings. 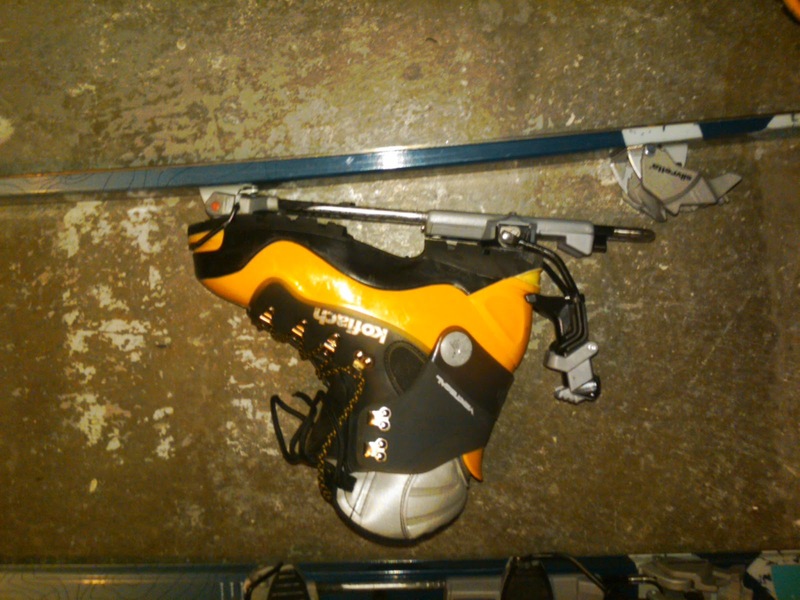 I also have the Pure Performance binding on another setup, however it is slightly heaver. 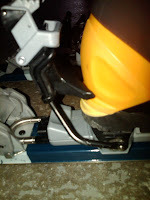 In addition, the wire toe bail on the 500 allows it to attach to any climbing boot that will hold a crampon. This is in contrast to all other backcountry bindings, including the Fritschi or Marker bindings which require a more traditional ski boot. Most times I use the Koflach Vertical which is a plastic shell climbing boot. It keeps my toes warm down below zero, but has a thinner than usual liner giving it a good feel for ice climbing. The liner is removable which is essential on overnight trips. This brings me to my tip of the day: DO NOT buy a ski boot that lacks removable liners if you are planning to go on overnight trips. It is essential that you be able to pull them out, and place them in your sleeping bag overnight to keep them warm and dry them out. Because the Koflach is not a ski specific boot it has a low ankle and thus, its hard to push the skis where you want them to go with any haste. My first trip exposed this glaring weakness. It was a Friday night in Arlington and over a foot of snow had fallen since rush hour ended. The plows hadn't hit the streets yet, so I decided to throw on the GT's and "tour" up to the water tower above Arlington Heights. While they climbed well, the return trip carving turns down the middle of the street was a challenge. Even when paired with a more traditional ski boot like the Garmont Mega Ride, the long and thin GT's are difficult to turn in deep powder snow. Despite this limitation, they do what they are designed to do, which is travel quickly over hilly terrain. 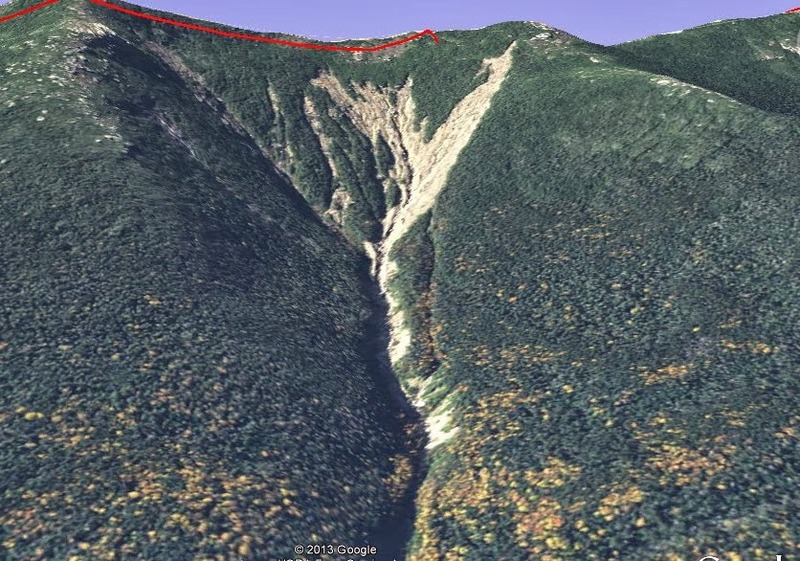 I've used them for tours in the hills around Montpelier, VT, laps around Great Brook Farm in MA, as well as a trip to the North Tripyramid Slide in New Hampshire. For you tele skiers, the Karhu XCD GT's would pair well with a boot like the Garmont Excursion and the Voile three pin binding for a (relatively) low cost setup. Excellent comment! I bought the GT last spring online and I am glad I did since they no longer exist! I have the Karhu Guide which is an incredible powder ski. For long tours (9 hrs + in moderate terrain)I will be using the GT. I have skins for them, but I have found they climb extremely well, so I will not have to use skins as much as I do for the Guide. I have heavy-duty Voile 3-pin bindings mounted on them. I use old, original brown soft Scarpa T-3 boots. This is a great set up. Thanks for the comment! I've also found that I haven't had to break out the skins except for the really steep stuff. I imagine the Voile bindings keep the setup much lighter than with my Silvretta's. The GTs are great skis. Amazing to see them paired with such a boot! 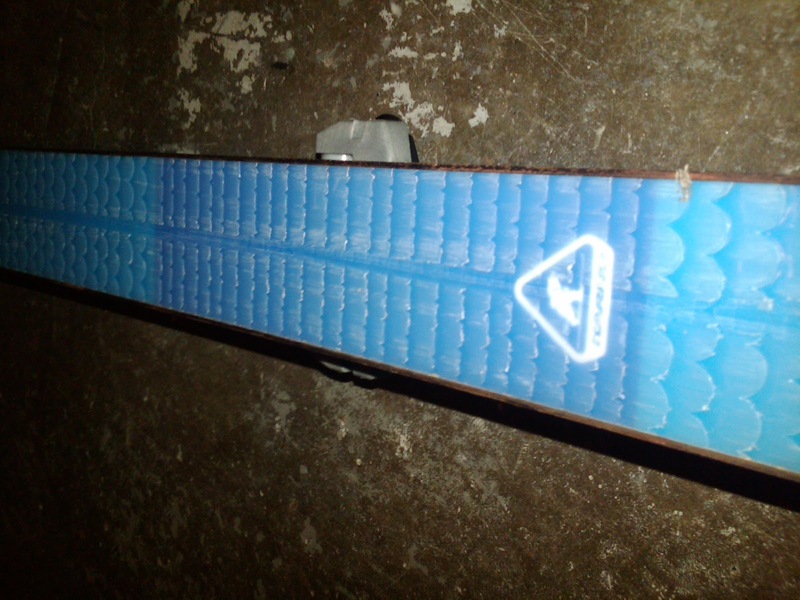 I would go a little shorter and wider for a ski that you're looking to use primarily on fresh powder. (Like the Karhu Guide/Madshus Annum) Also note that with a soft boot the turns will require more finesse. 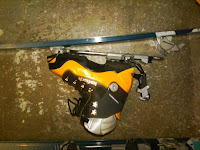 These skis were not meant to be AT Skis, so the boot and binding that were selected in this instance were a poor choice. If you want to carve turns with AT boots and bindings then it would be advisable to use an AT ski, not a XC Touring ski. In the Rockies we commonly see this ski paired with a BC NNN Binding for example. I couldn't agree more. I decided to learn the hard way. Even with a stiffer boot (Megaride) they have too much camber and length for carving turns in the woods. They do however work well for long distance xc touring on rolling terrain, and in that role a lighter binding (like the NNN or 3 pin Voile) would be ideal.